It all started with a sliding barn door and a bold and simple thought: what if we painted it “Geranium”? 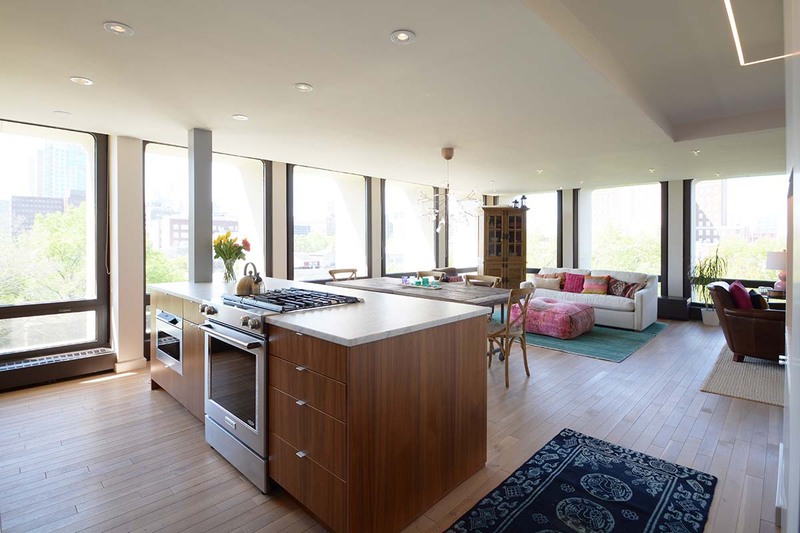 From there, a neutral-meets-ethnic loft interior unfolded at Society Hill Tower, perched high above the city of Philadelphia. 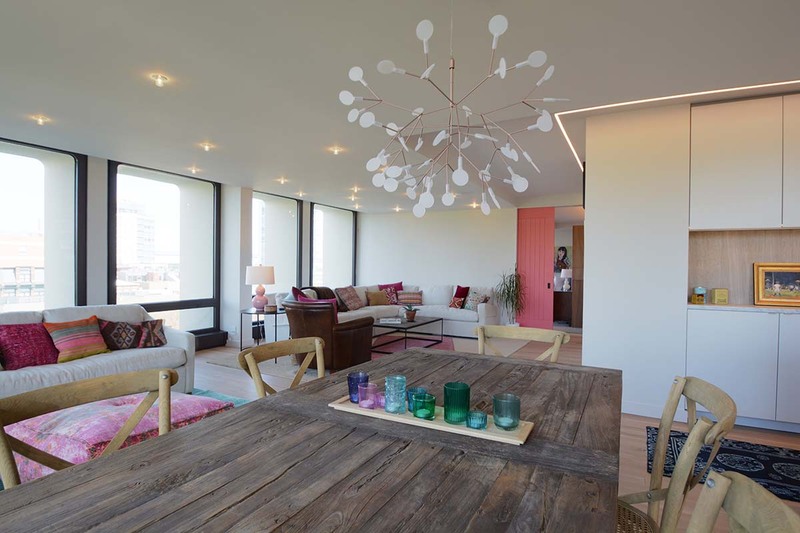 Our client brought us in as interior designers to collaborate with Ambit Architecture, who helped her merge two adjacent apartment units into one, large, open floor-plan unit. 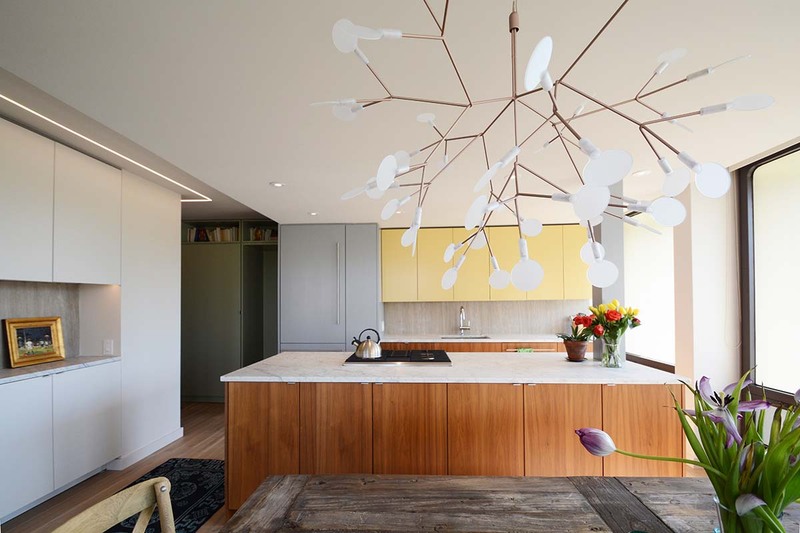 One of the challenges on a project like this is the very openness of the space – there are many furniture selections visually connected to one another, and connected to the kitchen, with its bold pops of yellow. So it was important to establish some fundamentally neutral tones that would provide unity from one furniture grouping to the next. We also wanted to make sure that the panoramic views of the city would remain an important focus of the space. Therefore, in the living and dining room, we chose large scale furniture pieces made from rustic or reclaimed wood, while upholstered pieces are covered in crisp linen or neutral leather. Then, we added layer upon layer of cheery textiles and prints. We started with jute and color reform wool rugs. Then, we added an ottoman also wrapped in an ethnic rug, kilim pillows, and velvety throws. 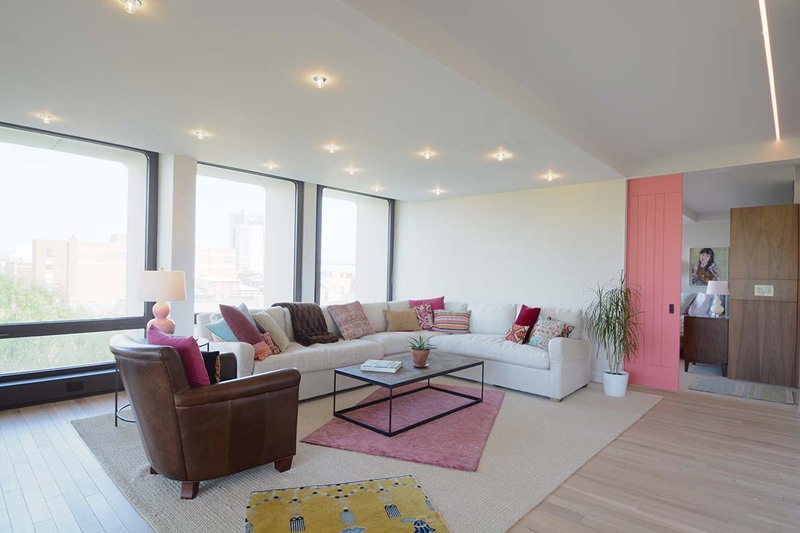 The result is a space that is unified, lively, yet calm. 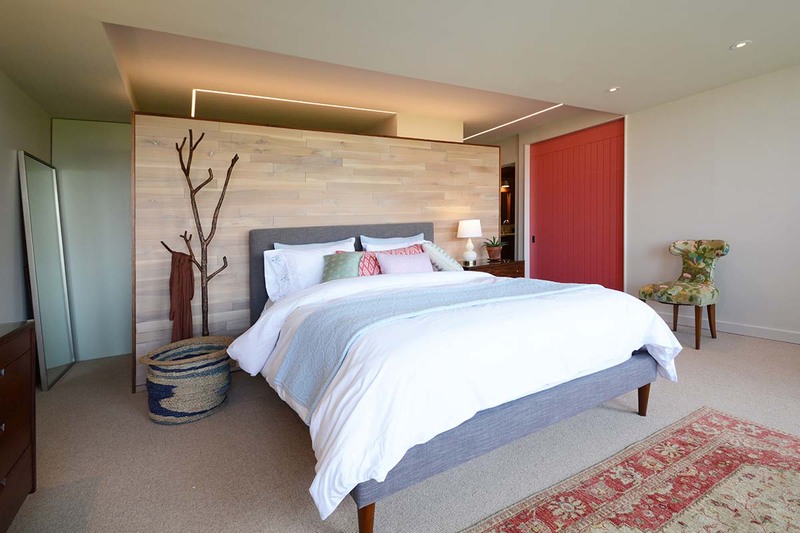 The master bedroom gets to share in the pop of color from the bright coral door, and features a headboard wall made of pale wood. The grey upholstered bed provides unity with the grey casework in the kitchen, while pillows in bright pops of pink and aqua provide warmth. White wall space is a placeholder for the time when the homeowner finds some perfect pieces of art. It is also a serene place to rest the eye, and provides no distraction from the gorgeous view.